Knowledge-driven processes are typically unpredictable in their execution. Experts working on them decide what’s the next best action to take. This is in contrast to traditional BPM, in which all possible paths of a process are predetermined and modeled into the process. Case management is a way to control and implement these unstructured processes. 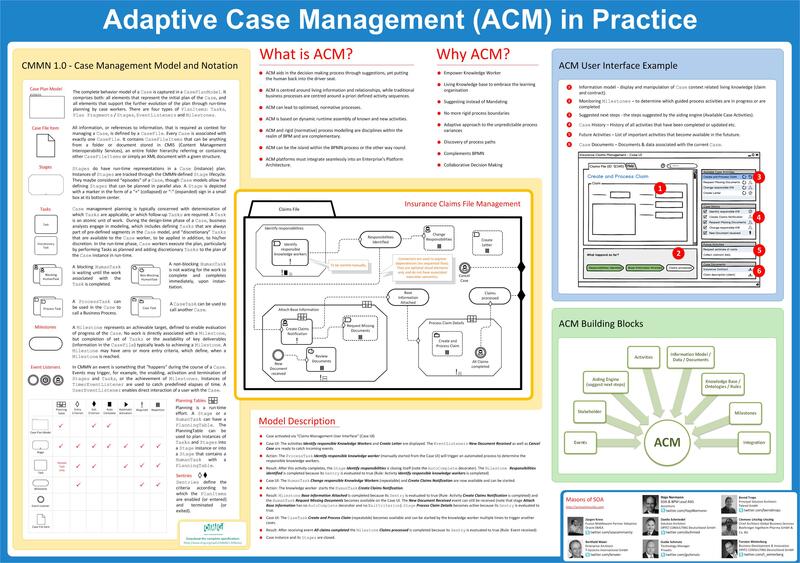 With the poster below we’d like to bring some of the key aspects of Adaptive Case Management (ACM) on one page. Why should I use ACM? How can ACM user interfaces look like? What are the main building blocks of an ACM solution? How to visualize ACM cases with CMMN 1.0?